The resurgence of social movements in Chile is something relatively new, especially when the claims of the movement are interconnected with environmental demands. Patagonia sin Represas, a social movement against the construction of 5 dams in the South of Chile has been able to mobilize the entire Chile from North to South, which creates surprise in a country that during the last years has great political apathy. 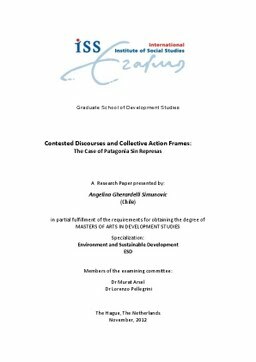 The main question of this research and by using the Chilean movement as a case study, is How do social movements such as Patagonia Sin Represas, contest state and market discourses through the development of collective action frames? The research has shown that success in mobilization responds to a varied set of factors, such as cultural resonance, structure of the networks their ability to generate and extended and inclusive frame. Relevance to Development Studies Social movements have strongly emerged around the world during the last two decades as expressions of contextual and structural grievances. These structural grievances are not given, but are culturally, economically and environmentally mediated and depend on how social movements and the networks they are inserted create meanings and significations to explain reality. By understanding how social movements generate discourses, how they interpret the problems and how they create collective identities vis-a-vis antagonistic discourses, we will be able to comprehend the deeper causes that drive social mobilization and therefore generate more appropriated and culturally sound processes which are more appropriated in culturally sound development social, economic and environmental processes.